Porsche is doing a Top Five series (why didn’t we think of that?) to highlight some of the coolest details on the 992 ahead of its release. This time, viewers are teaming up with Ivo van Hulten, Porsche’s Director of Interior Design, to take a peek at some of those little details that distinguish this Porsche from its predecessors. Of course, the controls are still typical of what you’d expect from Porsche, but with some new twists. There’s a 10.9-inch touchscreen display, a new steering wheel, and a centrally-positioned analog rev counter. The controls are sleek in the understated way that makes them classy, modern in a way that doesn’t hit you over the head with how New And Exciting it is. I’m personally not a fan of touch screens in cars, but the new 911's has a reasonable size and it’s not too in-your-face. After recognizing that the Porsche’s consoles can be neatly sorted into “eras”—a horizontal layout in the ’70s and early ’80s, a vertical layout in the late 80s until now—van Hulten and company decided to try something new. 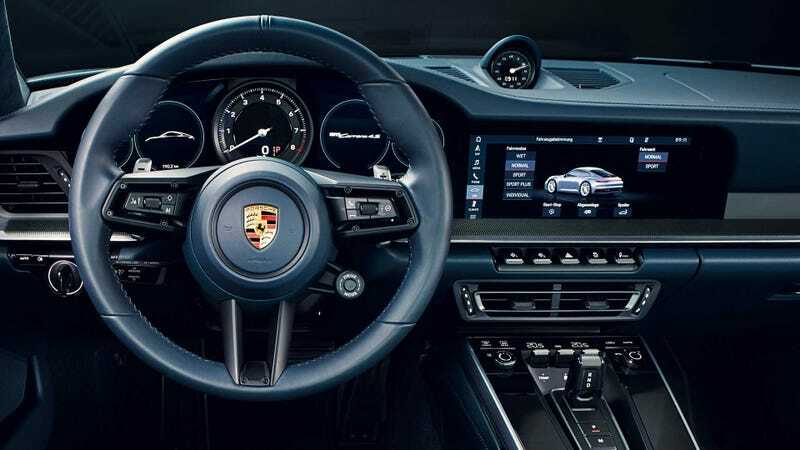 Porsche is using the original horizontal model as inspiration, but tucking the console under the dashboard. Porsche is avoiding a cluttered-looking console, and in the process, it’s emphasizing size and eye-pleasing clean lines. For me, the less I’m looking at a distracting, button-filled console, the more I can enjoy the driving experience. There’s a raised section in the middle of the dashboard that gives some depth, dimension, and character to the interior. This 3D section is intended to contrast the rest of the car and is entirely customizable—you can get it in mahogany, carbon, you name it. Whatever personal touch you decide to choose, it’s mirrored on the horizontal door trim. It’s one of those little things that does a lot of work: a feature intended to subtly draw your eye and give you a little sense of pride in your customization sensibilities. A neat feature, but I don’t imagine this would be one of those details that would make or break your decision to purchase a 911. Mmm, baby, the 911 is back to having five complete circles on the instrument cluster. They’re not all raised circles, but they’re wide and spacious. It’s good. It’s classy. It’s pleasing to the eye. I’m a fan. The rev counter is centrally positioned. Speed and temperature are to the left, traction and gas to the right. It’s another great example of classic-made-modern in a way that just works. Porsche isn’t succumbing to the all-digital trend of the modern era. Oh no. They’re keeping things old school by retaining some of those analog details that we know and love. There’s an analog rev counter, actual buttons that you can push, and a small but strange-looking gear selector. At the same time, you still have the digital screens that have become pretty much standard in every single car nowadays. I’m not the biggest fan of all-digital features. I miss the good ol’ days, where you could get that nice ergonomic sensation of pushing a real button instead of the weird little vibration certain infotainment systems provide. But with the new 911, it looks like we’ll find a good analog and digital blend. We’ll tell you more when we get to drive it for real in a few weeks.